Below is a list of workers compensation state funds by state. 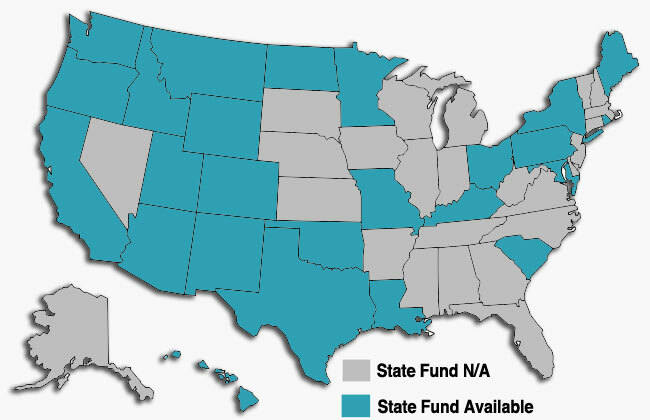 Please note that some states do not have a state fund. This list is based on membership to the American Association of State Compensation Insurance Funds, or AASCIF. What is a State Fund? A state fund is workers compensation insurer, legislated to function as a safety net for companies to retain insurance coverage, despite any risk or loss history. Furthermore, state funds can function as a competitive source of insurance for some businesses, aided by the non-profit business model, and specialization in one type of insurance – workers compensation! In an effort to help stabilize the economic environments, state fund help employers retain insurance coverage, thus helping them from going out of business and keeping jobs stable. State funds are positioned to help their respective states in the aforementioned ways via specialization. Many workers compensation insurance carriers offer other types of insurance, but state funds do not. By concentration of resources, knowledge, expertise, and service, have helped businesses thrive while also protecting employers and employees alike.